Today I take a stroll down memory lane and let Selena’s music lead the way. 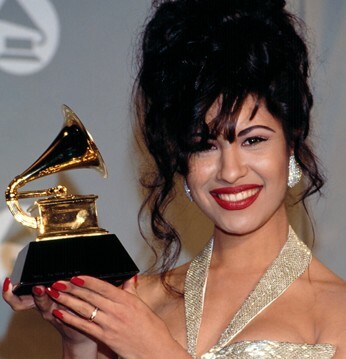 A tribute to la reina de la musica Tejana on the 15th anniversary of her death that’s made me realize that although a lot has changed–Mario’s Ballroom is now El Volkan–there’s one thing that remains the same: Selena’s vibrant music and contagious rhythms can always get me dancing. Share your own Selena stories or reflections in the comment section on this amazing woman whose life was cut short more than a decade ago. My favorite songs are No Me Queda Mas and Photos y Recuerdos. I still get teary-eyed when I listen to them. I went to McCallen for a friend’s wedding not long after her death and you could still see the sadness in peoples faces. There wa a heaviness in the air. I truly felt her presence there. my sister and i used to watch MTV espanol on regular tv here in texas back in the day. our first sighting of her was the video she did with the barrio boys. we instantly loved her and looked for every video of her since. we asked our dad to take us to a concert of hers, but i think they sold out too fast. well when Amor Prohibido came out, everyone went crazy. her album was flying off the shelves. i would ethusiastically sing along butchering every word. i moved to chicago for college and in 95 i found out about her death on ‘entertainment tonight’ of all places. i was shocked and was surrounded by people who had no idea who she was (in my dorm). i called home. when i came home that summer, everyone had a tribute to selena on their vehicles and t shirts. kids at my job would talk about selena all the time proudly saying they are going to get her last album. selena was around in my awkward teens, when i partied with my girls (hey guys! ), and her singles album was given to me by my husband as a valentine’s gift. her music is still fresh to me. i mean fresh in that newness. just timeless. i still watch her houston concert when it airs. she was so full of life. i dance to her songs and sing LOUDLY along to every song, butchering it i’m sure, still. Amor Prohibido, Si Una Vez, and Techno Cumbia are my favorites if i had to choose. I hate to confess, and I don’t know why but I didn’t really give Selena a chance until after she died. She finally made it onto my cd player when I was in college and working at Greyhound, my co-worker gave me a Selena cd that ended up in lost and found. Turns out I loved her music.